Bill Thomas Performance Horses goes "Blue"
Bill Thomas of Bill Thomas Performance Horses located in Saginaw, Michigan has been involved in horses his entire life. He is a true cowboy and loves everything horse related from working cow horses to trail riding! 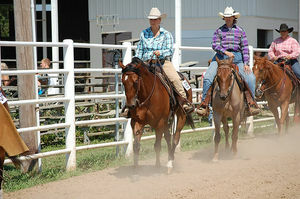 Bill is actively involved in the Foundation Quarter Horse Association and also the National Reining Horse Association. 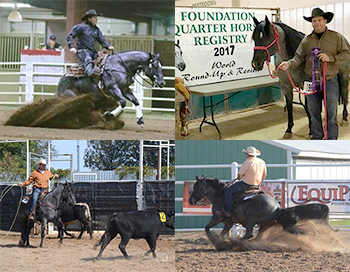 Bill is a multiple world champion title holder in disciplines from ranch horse to reining. While he focuses on training and showing he is also a breeder and seller of good quality horses. 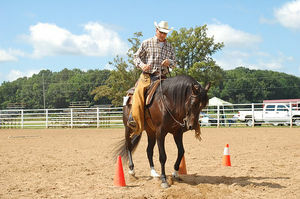 Bill is a true horseman and enjoys talking and visiting with anyone about any type of horsemanship. If you’re looking to breed a horse, sell a horse, or have a horse trained, contact Bill Thomas. visit his website billthomasperformancehorses.com you can also find his business page on Facebook; Bill Thomas Performance Horses. • Qualified for the North American Affiliate Championship in Oklahoma City which is a great feat for both horse and rider! You will not find a nicer, quieter stallion than "Blue", he is just a nice horse to be around, a nice horse to show and amazing to watch in the pen! His unique looks, blue roan color, solid build, cutting horse breeding, reining talent, and disposition make him a nice stallion to cross on your good mare. "Blue will stand at stud for the 2018 breeding season at Bill Thomas Performance Horses. If you want to "get a little Blue" call Bill at 989-239-3141 for breeding information. Limited booking for 2018, book early.